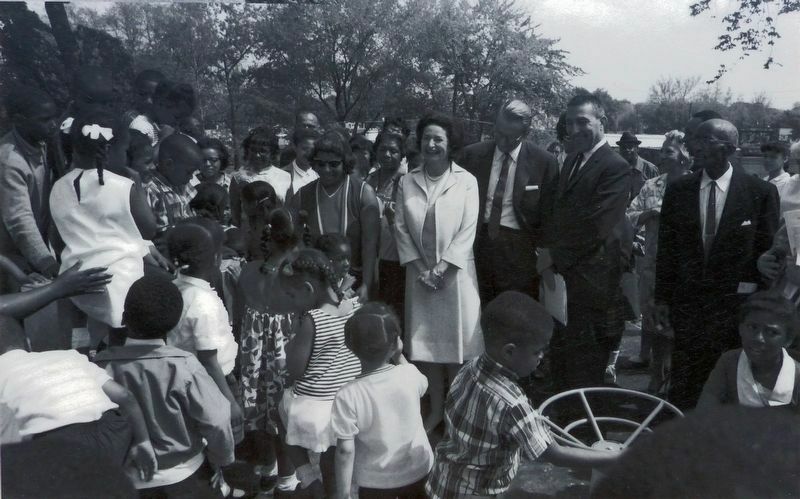 On, May 18,1966, Crowds Gathered here to witness Lady Bird Johnson (1912-2007) rededicate eight acres of Watts Branch Park. 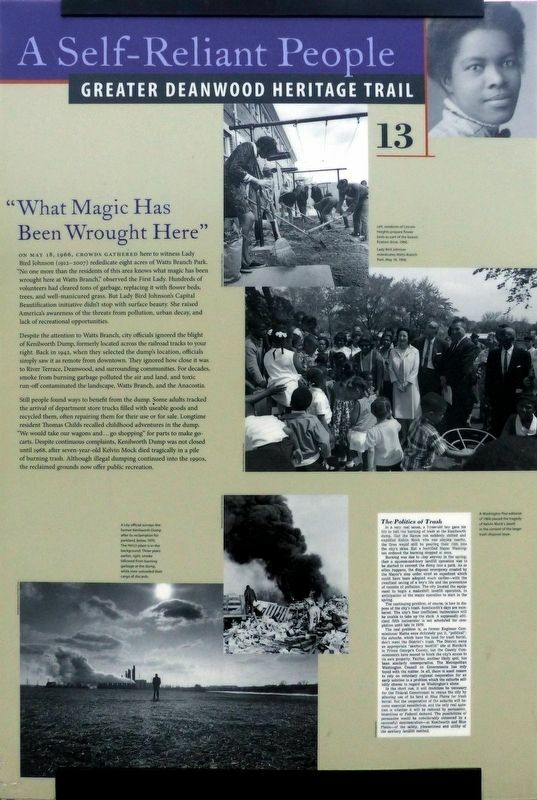 “No one more than the residents of this area knows what magic has been wrought here at Watts Branch,” observed the First Lady. Hundreds of volunteers had cleared tons of garbage, replacing it with flower beds, trees, and well-manicured grass. 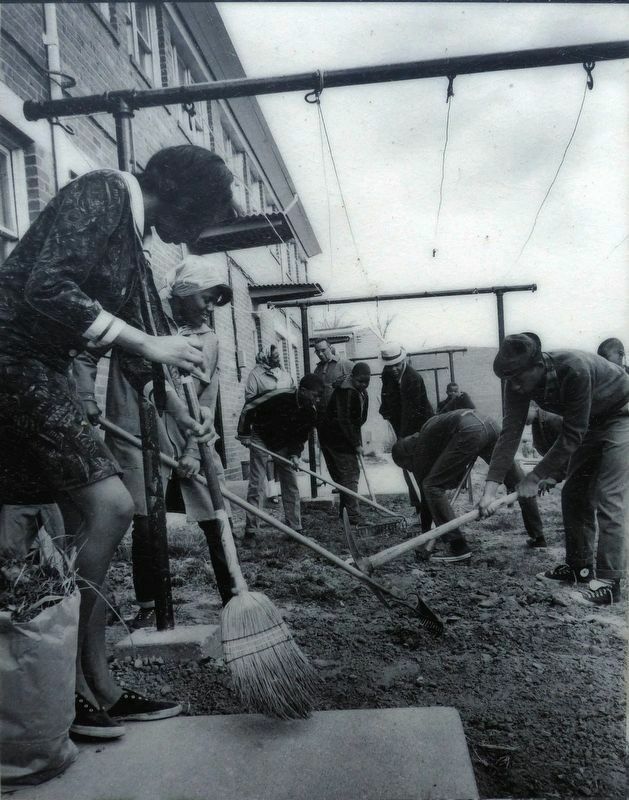 But Lady Bird Johnson's Capital Beautification initiative didn't stop with surface beauty. She raised America's awareness of the threats from pollution, urban decay, and lack of recreational opportunities. Despite the attention to Watts Branch, city officials ignored the blight of Kenilworth Dump, formerly located across the railroad tracks to your right. Back in 1942, when they selected the dump's location, officials simply saw it as remote from downtown. 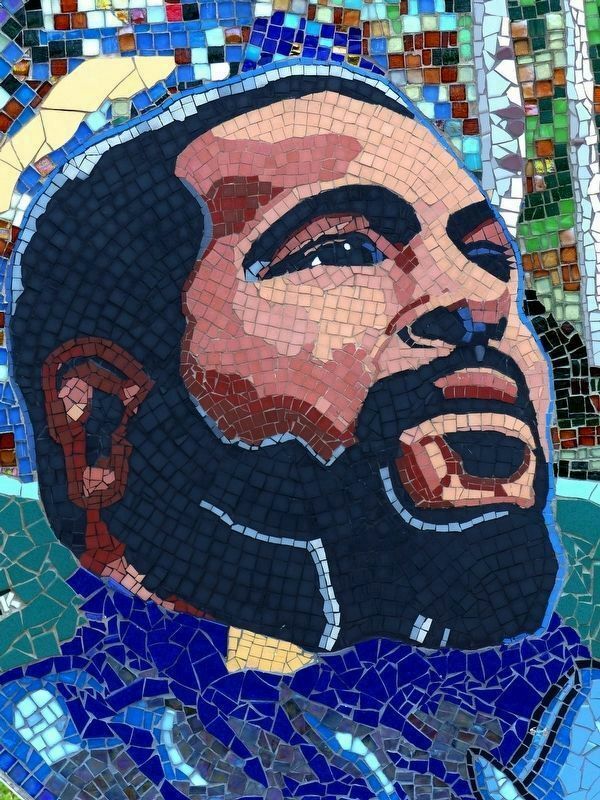 They ignored how close it was to River Terrace, Deanwood, and surrounding communities. 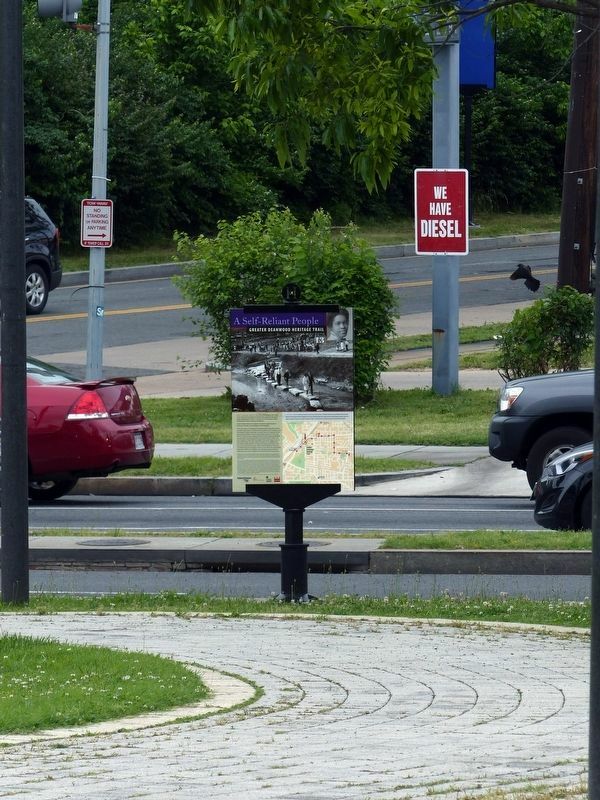 For decades, smoke from burning garbage polluted the air and land, and toxic run-off contaminated the landscape, Watts Branch, and the Anacostia. to benefit from the dump. Some adults tracked the arrival of department store trucks filled with useable goods and recycled them, often repairing them for their use or for sale. Longtime resident Thomas Childs recalled childhood adventures in the dump. “We would take our wagons and … go shopping” for parts to make go-carts. 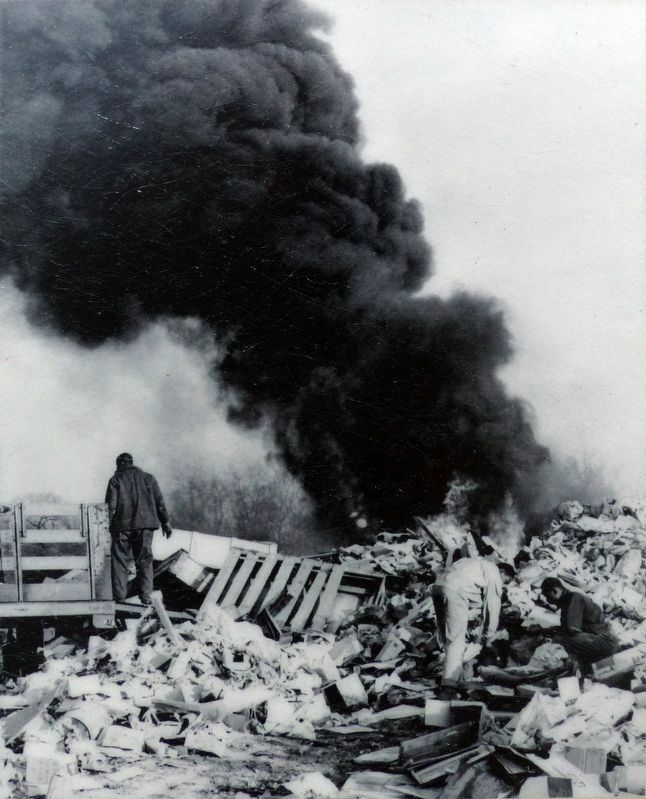 Despite continuous complaints, Kenilworth Dump was not closed until 1968, after seven-year-old Kelvin Mock died tragically in a pile of burning trash. Although illegal dumping continued into the 1990s, the reclaimed grounds now offer public recreation. Location. 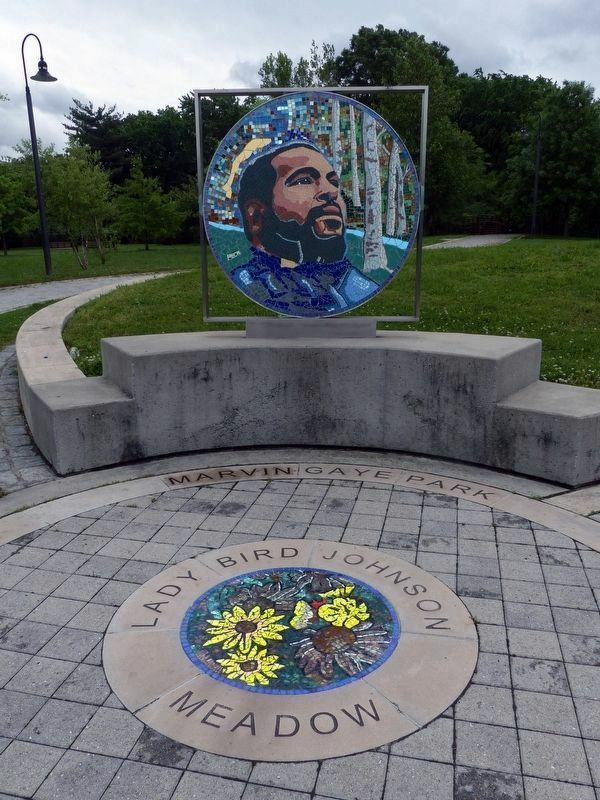 38° 54.108′ N, 76° 56.551′ W. Marker is in Mahaning Heights, District of Columbia, in Washington. 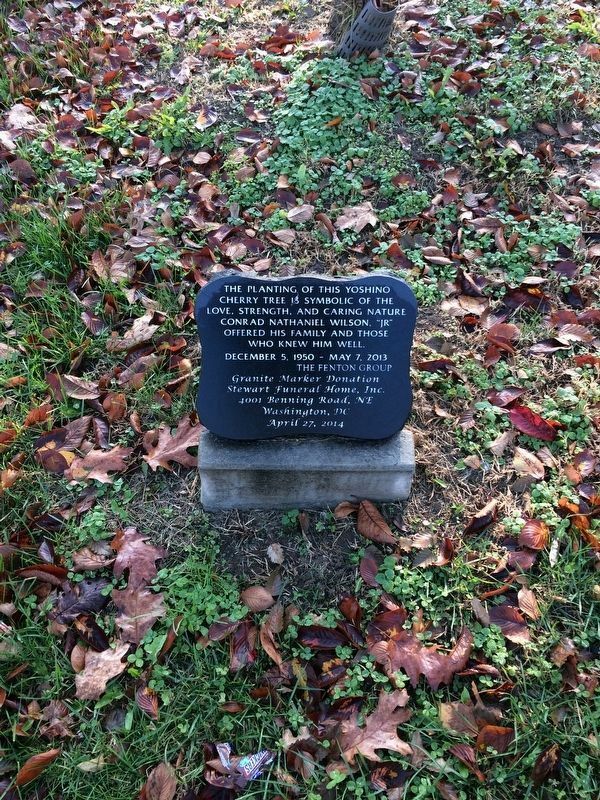 Marker is at the intersection of Nannie Helen Burroughs Avenue Northeast and Minnesota Avenue Northeast when traveling east on Nannie Helen Burroughs Avenue Northeast. Touch for map. Marker is in this post office area: Washington DC 20019, United States of America. Touch for directions. (approx. 0.2 miles away); From Gambling to Garden Apartments (approx. 0.2 miles away); Shopping on Sheriff (approx. 0.3 miles away); With These Hands (approx. half a mile away); Fort Mahan (approx. 0.6 miles away); From Gardens to Garden Apartments (approx. 0.6 miles away). Touch for a list and map of all markers in Mahaning Heights. 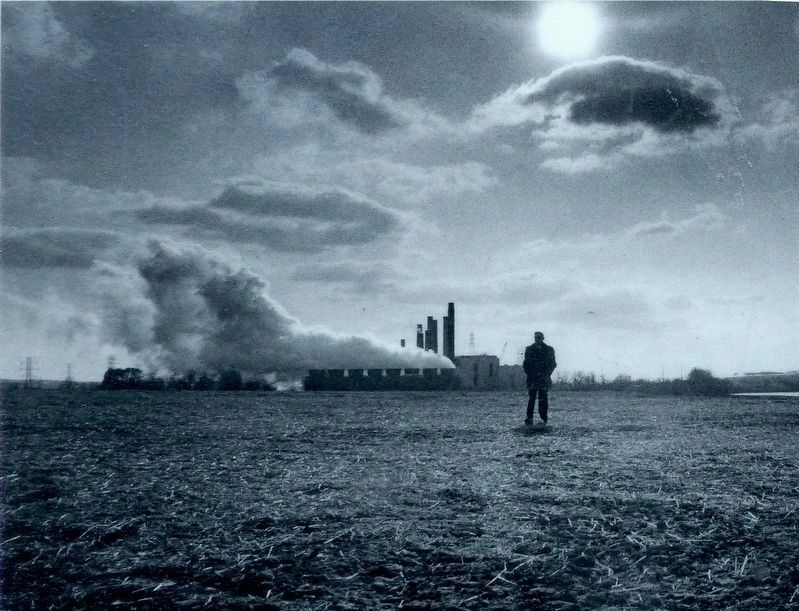 A city official surveys the former Kenilworth Dump after its reclamation for parkland, 1970. The PEPCO plant is in the background. 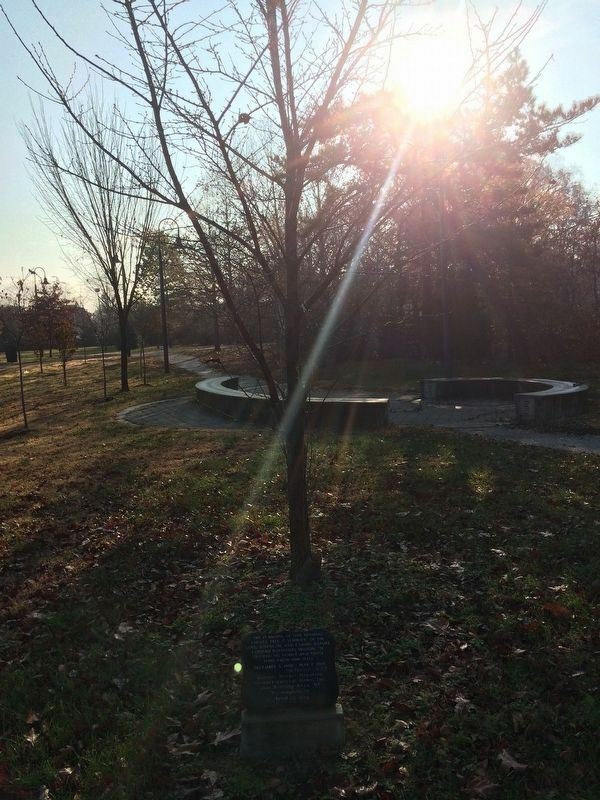 The planting of this Yoshino cherry tree is symbolic of the love, strength, and caring nature Conrad Nathaniel Wilson, "JR" offered his family and those who knew him well. More. Search the internet for “What Magic Has Been Wrought Here”. Credits. This page was last revised on March 20, 2019. This page originally submitted on May 8, 2017, by Allen C. Browne of Silver Spring, Maryland. This page has been viewed 151 times since then and 11 times this year. Last updated on March 7, 2019, by Devry Becker Jones of Washington, District of Columbia. Photos: 1, 2, 3, 4, 5, 6. submitted on May 8, 2017, by Allen C. Browne of Silver Spring, Maryland. 7, 8, 9. submitted on May 11, 2017, by Allen C. Browne of Silver Spring, Maryland. 10, 11. submitted on December 3, 2017, by Devry Becker Jones of Washington, District of Columbia. • Bill Pfingsten was the editor who published this page.